A luxury 3 bedroom, 2 bathroom villa with private heated pool and jacuzzi located in Guime, Lanzarote. Sympathetically restored, this 200-year-old property retains many original features and rustic charm. The villa has a master kingsize bedroom with en-suite, a further double bedroom and one twin bedroom; there is also a separate family bathroom. The whole property is luxuriously furnished throughout. Externally there are 2 large terraces (one of which is covered), and also a built in BBQ. The large solar/electric heated private swimming pool is treated with a salt water system, meaning no chemicals are used to maintain the water quality, making it very environmentally friendly. There is also a large jacuzzi next to the pool with views across the mountains to the sea. The villa has all you need if your desire is to simply relax all day by the swimming pool or in the spa, enjoying the wonderful climate and private alfresco dining. However, the superb location of Finca Bougainvilla makes it an ideal base for walking, hiking or cycling holidays on Lanzarote. If you prefer sunbathing, the long white beaches of Puerto del Carmen are only 15 minutes drive away. Surfing, scuba diving, snorkelling, windsurfing, kitesurfing, fishing, etc. are all readily available there and at the many other beaches on the Island. Other nearby recreational facilities include an aqua park, two 18-hole golf courses and the Rancho Texas animal park. The finca nestles in the sleepy village of Guime. The village has a nice bodega serving drinks and tapas and also ‘the Sociedad’ – a meeting place for the villagers. Within the village, and just a few minutes walk from the property is a small friendly shop. They sell just about everything: freshly baked bread, meat, fish, and locally grown fruit and vegetables. The upmarket marina at Puerto Calero has a good selection of restaurants where you can enjoy some of the ocean’s finest and freshest produce or simply while away a few hours watching the world go by. Puerto del Carmen is the main tourist resort with a great number of bars, restaurants and night life! Guest are welcome to use our free wifi internet connection whilst staying at the villa. The grand dining room is the central room of the property. It links the lounge, kitchen & garden room. With it’s Cathedral style ceiling the room was originally created from a former interior courtyard. There is a typical Canarian unit built along one wall with a traditional rustic dining table and 6 high back sea grass chairs – lending itself to candlelit dinner parties. The luxurious sofas in the lounge make it a great place to chill out, listen to music or simply relax and watch the 40″ flat screen TV with Internet system. You can also listen to your own ipod (don’t forget your adaptor). The covered terrace is the ideal setting for eating alfresco after conjuring up your own culinary delights on the built in barbecue or simply chilling in the daytime, out of the heat of the sun. The bougainvilla tree also provides some shady places. The hub of the house is probably the bar/garden room (our favourite). Everybody gathers here either before or after a swim in the heated pool, or to relax in the jacuzzi with a glass of wine. It’s just a cats whisker away from the glorious sunshine. You are literally spoilt for choice. The covered terrace has an outside dining area comfortably accommodating 6 people, the outside terraces are subtly lit at night. The property boasts 3 large and highly specified bedrooms. A master kingsize bedroom with en suite, 1 double bedroom and 1 twin bedroom, all with built in wardrobes & luxurious bedlinen. Our exquisite property makes for a very relaxing holiday in homely surroundings. For further details please use our contact form or phone us directly on 636 135 487 (Spain). Arrecife is the main town of the Island. Approximate flying time from the U.K. is 4 hours. Finca Bougainvilla is located in the beautiful village of Guime which is approximately 15 minutes drive from the airport at Arrecife. Guime is indicated by the red circle on the map below. Towels are changed mid week. A welcome pack is placed in the property ready for your arrival. Wheel Chair Access to property *. * The property has wheelchair access through the wide entrance doors, however there are some small steps without ramps between some rooms. As usual we enjoyed all that your finca has to offer, great facilities, privacy, sun and shade, wonderful pool and hot tub which warmed us up after the sun faded behind the clouds and the chill wind blew! All the family and friends were really impressed by the outlay and amenities that the finca had to offer. Baby Lucas loved everything and especially the pool. We look forward to our 4th visit in September and may the sun shine throughout our next stay. Very highly recommended for a 3 generation venue. Fantastic property. We loved every minute being there with our two toddlers.The owner John was very helpful and nothing was too much trouble for him. We loved this place and the night time in the garden/pool. It is so quiet and private. Everything is in the villa you will need, the owners even provide soap in the bathrooms! In short, a super value, fantastic property that is a total joy to stay in. Packed with far more character than other villas we have stayed in. 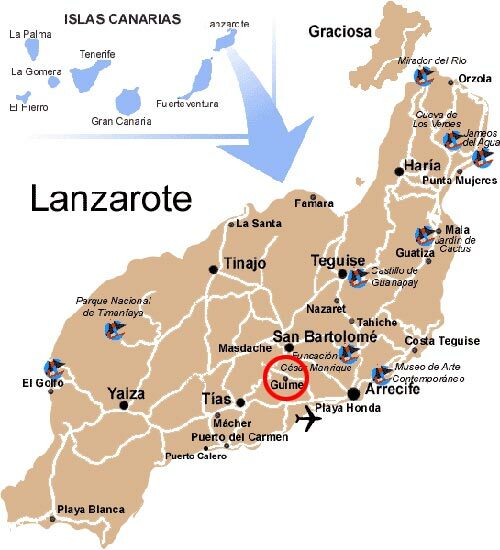 Book car through Autoreisen (cheapest on island) villa is only ten minute drive from airport, but no plane noise.Ten minute drive to Puerto del Carmen (fantastic beach for kids). Playa Blanca an easy 30 minute drive (best beach around). We are counting the days to our return! We booked this villa for our honeymoon and we were NOT sorry. We love the island and have visited it for our holidays for many years, so we knew we were going to have a nice time, we wanted the best Villa we could find and we were not disappointed. We have stayed in “many” villas over the years and we can safely 100% say this Villa is on top of the list. There is nothing you will be left needing or wanting, the owners are wonderful kind and very thoughtful people and have thought of evrything right down to the smallest personal detail, which just adds to the fantastic experience you will have if you book this Villa.Truly lovely people. All the family and friends were really impressed by the outlay and amenities that the finca had to offer. We had our toddler with us and it is a great safe place to relax as a family, also the added bonus of having a lovely playground 2 minutes up the road by the local shop, was useful too when you felt the need for a little stroll. I cannot say enough about this Villa and we will not be looking to book any other Villa for our future holidays with our children or just ourselves to our favourite island.It will become a very special place to you just like it has to us. If we can manage it this year we will most certainly be booking this Villa again and hopefully many more times in the future. I am trying to balance the review by adding the so called bad points and be constructive, but I cant think of one bad point or anything to add to be Constructive, sorry. Thanks for making our honeymoon so special. We have just returned from a 2 week stay at this beautiful villa. The photos tell you its good but we were all blown away when we arrived.Its a stunning villa superbly and thoughtfully aquipped. The children lived in the pool and jacuzzi. Guime is a very peaceful and safe village. I had no concerns letting the children go to the village shop and take the recycling on their own. Its location is ideal, just a short drive from the airport and several beaches. With 4 children its not always a holiday for me but I was able to relax here, even cooking was a pleasure! John regularly cleaned the pool and garden. Thank you John and Anthea you have a real gem in Finca Bougainvilla. Dear Anthea, we had a lovely holiday thanks very much. The villa is lovely and I’m very jealous and I assure you we would indeed love to stay there again sometime in the future. I would definitely recommend it to friends and family. The village it is in is so quiet and peaceful and much much nicer than Puerto Del Carmen. Wishing you all the best for the New Year. Just a short note to thank you for letting our family rent your finca villa. The villa was beautiful and of a very high standard and made our stay on the island very pleasant indeed. As we have been to Lanzarote a few times, we had seen all the sights before, so to stop somewhere as nice as your villa, rather than a hotel based holiday where you try to find something to do just to escape. The photos you have posted on various sites do not do the villa justice as was summed up by my son when we entered the villa “ITS LIKE THE TARDIS”. Also the professionalism of the whole experience. A big thanks again and I would not hesitate to recommend to anybody. This is just a note to say thank you for our stay at your finca. It’s such a fantastic place, beautifully looked after and tucked away in an ideal location. We just wanted you to know how much we all appreciated it – we’re already looking forward to our next winter sun visit! Thank you so much for letting us stay in your beautiful villa. It was more than we could have hoped for. The location is so peaceful yet close enough by car to the sea front. We would love to make a return visit sometime, or if you have any more beautiful villas hidden up your sleeve please let us know. Thank you again it was a truly memorable holiday. Just a short note to thank you so much for allowing us to rent your beautiful finca last week. What a wonderful, spacious property and so tastefully done… we were very envious! We had a fantastic week of sunshine, rest and relaxation interspersed with some excellent food! All in all, a wonderful way to spend a week. Our sincere thanks once again!